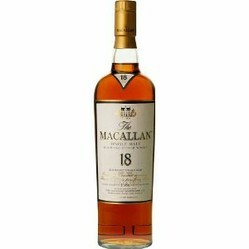 If you're looking for a gift for a whisky lover, you can always, in the last resort, just buy them a bottle of whisky. However, if you would like something a little more inventive then you have plenty of options - all of which will be gratefully received by your whisky loving gift recipient. 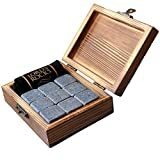 It seems to me that whisky lovers enjoy discussing and reading about whisky almost as much as they enjoy drinking it - which should give you a clue as to our first whisky related gift choice. Books on whisky make a great gift. 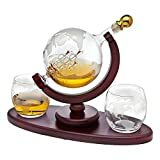 They will allow your whisky loving gift recipient to delve into the long history of this noble spirit, or to review the different whiskies on offer and plan ahead for their next tipple. There are so many different brands of whisky available worldwide that nobody can try them all. A study of the available literature might give a whisky lover some thoughts as to which whisky he, or she, would like to try next. Whisky flasks are another very popular gift for whisky lovers. They are great for carrying whisky with you when you're out and about and they come in a huge variety of decorative designs, materials and standards. The round, slim flasks are known as "sporran flasks", for the simple reason that they are specifically shaped to fit into a Scotsman's sporran. However, they will fit just as easily into a jacket pocket, a handbag or a laptop bag. If that's how your whisky lover will use the flask, then there's no need for it to be round of course - but they do look rather decorative. Another very popular choice is the "hip flask". These have a slight curvature to the flask so that it will conform to the shape of the user's body if they put it in their hip pocket. The most common materials are pewter, silver and stainless steel. 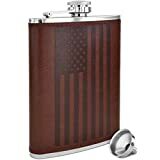 Decorative embellishments abound, and you can have your gift recipient's initials, or even a personal message, engraved on the flask should you wish. 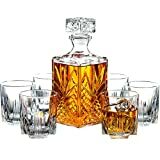 An elegant whisky decanter, possibly with some matching glasses, makes a very classy gift for any whisky fan. These come in an endless variety of decorative styles and shapes, so there's bound to be something to suit your gift recipient's taste. As previously mentioned, there is a huge range of different styles to choose from. If in doubt, a clean uncluttered design is always a good choice. This will let the color, and depth of body, of the whisky inside the decanter be the major feature - which is just as it should be. Some people like to put ice in their whisky - especially in the summer months. That's fine, but the ice melts, turning to water as it does so, and this means that the whisky becomes diluted. Whether or not that's a problem will depend upon the individual taste of the individual whisky drinker - but it's a problem that can be avoided. "Whisky Stones" are small cubes cut from soap stone. Put them into the freezer for 3 or 4 hours, then put 3 of the stones into your whisky. 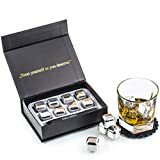 You will have a nice cold "Whisky Rocks" without the problem of melting ice. 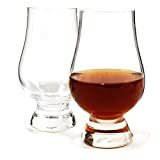 Most whisky drinkers who appreciate a nice single malt will tend to take their tipple from a special whisky glass. 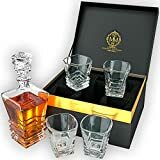 Cut crystal whisky tumblers are a very popular choice. However, there are other, equally classy options. 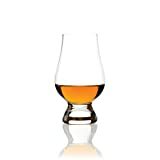 "Nosing glasses" look great and are specially designed to channel the aroma of the whisky in the glass to the taster's nose, thanks to the distinctive tulip shape of the glass. Some nosing glasses come with a "watch glass". This is just a flat glass disc which is used to cover the top of the nosing glass (after a couple of swirls). Leave this in place for 5 minutes or so and the aroma will build up to let the taster fully appreciate all of the subtle nuances in the whisky's bouquet. Nosing glasses are sometimes referred to as "dock glasses". This is because this type of glass was often used by 17th century wine and spirit merchants at the docks prior to agreeing a price for their purchases. Whatever you wish to call it, a set of nosing glasses will be an unusual, but very welcome, gift for a whisky aficionado. As a whisky lover myself, I came to see what you were buying me. :) I can confirm that the hipflasks are very useful. I've had mine for years and it gets a lot of use at events or on holidays. I recently had a birthday and many people defaulted to whisky as a gift for me. I received some multi-packs of miniature whiskys, which were wonderful. They allowed me to sample some which I might not otherwise have bought. I did find some keepers in there too.